Alabama State University is a Historically Black College and University (HBCU) in Montgomery, Alabama. Founded less than two years after the end of the Civil War as the Lincoln Normal School in Marion, Alabama, it is one of the oldest HBCUs in the United States. Nine ex-slaves, Joey Pinch, Thomas Speed, Nickolas Dale, James Childs, Thomas Lee, John Freeman, Nathan Levert, David Harris, and Alexander H. Curtis, made up the first Board of Trustees. Under their guidance, the black and white community of Marion raised five hundred dollars to buy land for the school’s campus. The money to build the school building came from the American Missionary Association (AMA). 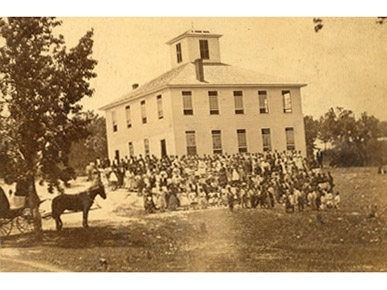 In 1873 the State of Alabama assumed control over the Lincoln Normal School and renamed it the State Normal School and University for the Education of Colored Teachers and Students. In 1874, the school was renamed again becoming the Alabama State Lincoln Normal School and University (ASLNSU). On June 30, 1880 the first class of six students graduated from the ASLNSU. In 1887, the state moved the institution to Montgomery, the state capital. Twelve years later in 1899 the state legislature provided funding for the first time and changed the institution’s name again to the Normal School for Colored Students. William B. Paterson, a native of Scotland was named President of the Normal School He, in turn, hired John W. Beverly who became the school’s first African American instructor. In 1915 Beverly succeeded Paterson, becoming the school’s first black president in 1915. Beverly initiated a program of curriculum development that allowed the school to become a two-year junior college in 1920. By 1929 the junior college became the State Teachers College and awarded its first baccalaureate degrees in teacher education in 1931. In 1948 there was another name change to Alabama State College for Negroes, then in 1954 to Alabama State College. In 1969 it became Alabama State University (ASU). Located in Montgomery, Alabama State University’s faculty, staff and students were directly involved with the Montgomery Bus Boycott which began in December 1955. Rosa Parks, who along with Rev. Martin Luther King, became the most recognizable figure in the Boycott is an alumnus of Alabama State. After Parks’ arrest Alabama State English Professor Jo Ann Gibson Robinson and two of her students mimeographed 35 thousand leaflets which were crucial in spreading word of the Boycott. Gibson and Ed Nixon, the initial leaders of the boycott, selected Martin Luther King to head the Montgomery Improvement Association which became the organizational arm of the boycott. Paul Finkelman, editor, Encyclopedia of African American History, 1896 to the Present: From the Age of Segregation to the Twenty-First Century (New York: Oxford University Press, 2009); http://www.alasu.edu/about-asu/history--tradition/the-asu-legacy/index.aspx; http://www.alasu.edu/about-asu/stats--facts/index.aspx; http://www.alasu.edu/about-asu/president--administration/presidents-bio/index.aspx.